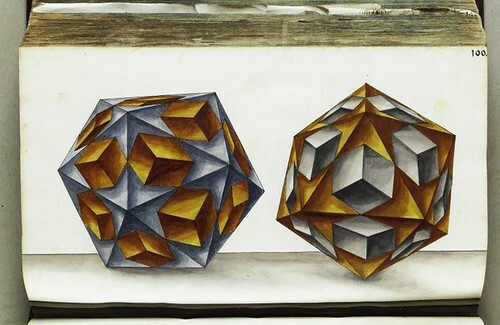 The artist responsible for the remarkable collection of geometric designs seen above and below is Lorenz Stöer (c.1537-c.1621), about whom little is known with certainty. He was born in Nuremberg and moved to Augsburg in 1557. He is variously described as a painter and a draughtsman and he may have been the son of a woodcut artist. 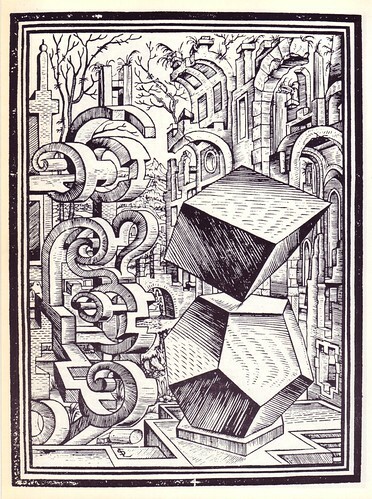 Until relatively recently, Stöer's principal legacy was thought to have been the eleven woodcut illustrations seen above that show combinations of regular and semi-regular solids in landscapes with fanciful ornamental shapes. 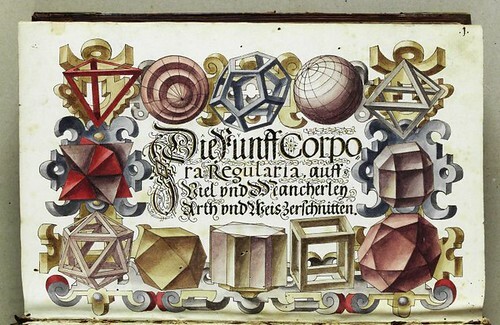 This suite of eccentric designs was published under the title, 'Geometria et Perspectiva', in 1567.
arranged and presented by Lorenz Stoer, painter and citizen of Augsburg'. 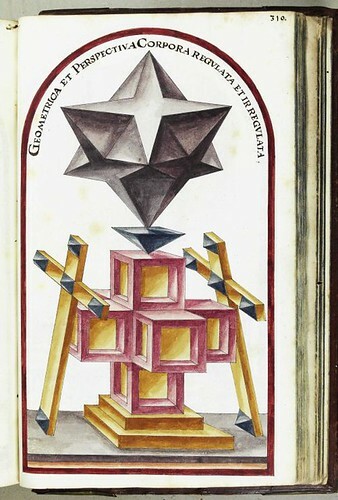 'Geometria et Perspectiva' was sufficiently popular to warrant publication of a second edition, but it's difficult to gauge the extent of influence the book had over marquetry* workers. Perhaps its main effect was as conceptual inspiration, although the Met. Museum has a collector's cabinet with fairly evident connection to Stöer's designs and another cabinet of comparative style is known to exist in Munster [also]. 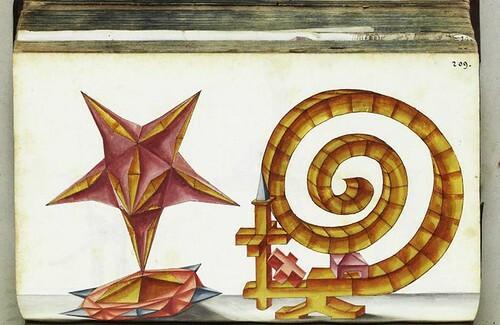 Apparently there had been little in the way of academic study of Stöer apart from a couple of mid-20th century papers that linked him to two Nuremberg goldsmiths - Hans Lencker and Wenzel Jamnitzer - forming a trio of mannerist artists interested in geometric design and perspective. But a large portfolio of coloured drawings was discovered (when?) 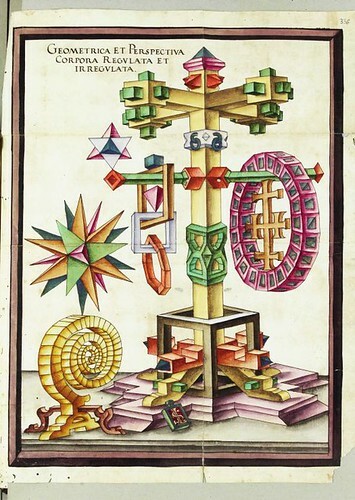 at the Munich University Library that has, in the last fifteen years, been attributed to Stöer (samples seen below). 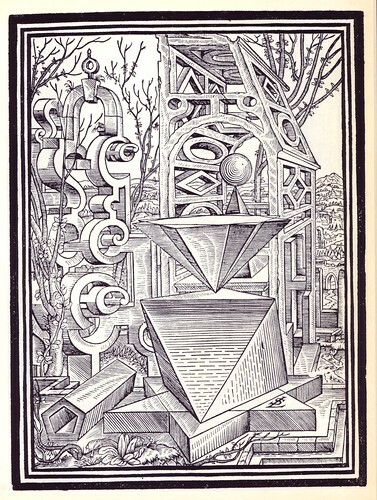 "The woodcut sequence 'Geometria et Perspectiva', that was published in Augsburg in 1567, has long been considered the principal work of Lorentz Stoer. 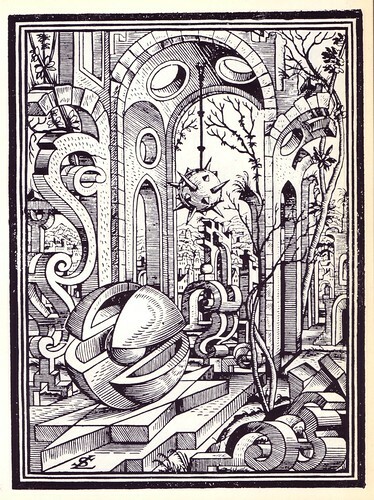 Several hundred hitherto virtually unnoticed drawings, owned by the University Library in Munich, triggered the current study. For the first time, a proper academic evaluation was dedicated to Stoer’s works. The description of the prints and drawings that were already known to scholarly literature was completed by the presentation of the large number of unknown works that had been discovered in the course of the analysis. By means of critical discussion of questions of attribution and influence, and by confirming decisive points in Stoer’s biography, a re-evaluation of his enlarged œuvre was accomplished: it was the representation of stereometric solids that was Stoer’s major interest. 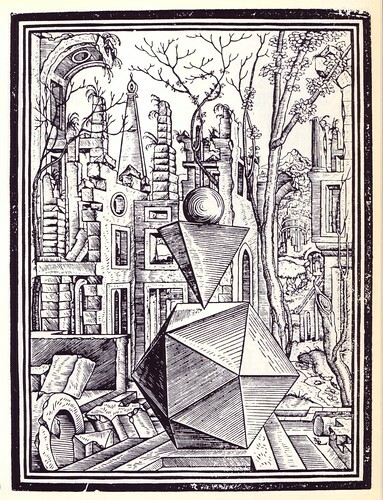 The overview of the polyhedron literature and the analysis of the contemporary treatises on geometry and perspective enabled a differentiated look at Stoer’s drawing method, contrasting it with that of the Nuremberg goldsmiths Hans Lencker and Wenzel Jamnitzer. The final discussion of the purpose of the drawings facilitated a new appreciation of his work. 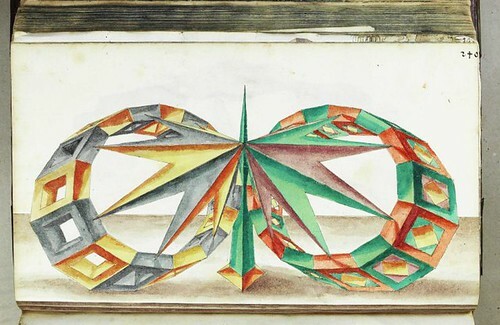 The study makes an important contribution to the positioning of Lorentz Stoer as a German Mannerism artist in the context of craftsmanship, ornamental arts and geometry." Kim H Veltman: "Stoer's manuscript was actually a compilation of over three decades' work ranging from 1562 through 1599. 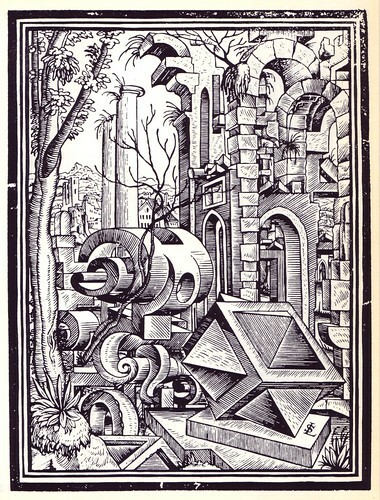 The novelty of his remarkable effects lay mainly in his combination of earlier techniques. 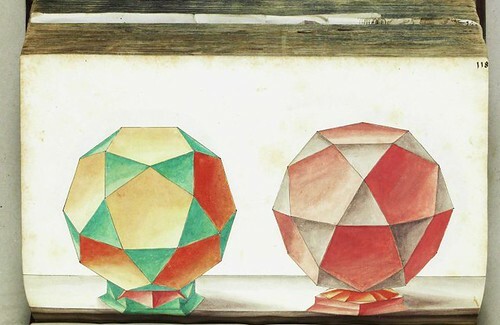 We have noted, for example, that Dürer's workshop explored the use of shading to enhance the spatial effects of these solids. Jamnitzer and Lencker developed this technique using narrow banks of colour to accentuate the borders of these shapes. Stoer added a feature of his own. 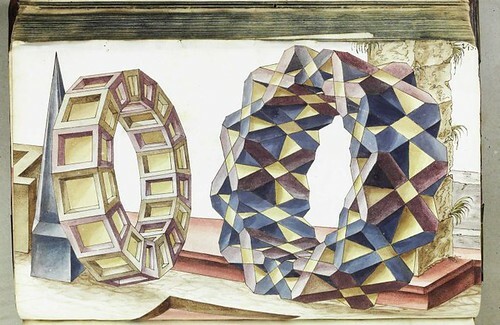 He used the surfaces of his solids as spaces in which to inscribe further polygonal shapes. Frequently he combined both techniques. 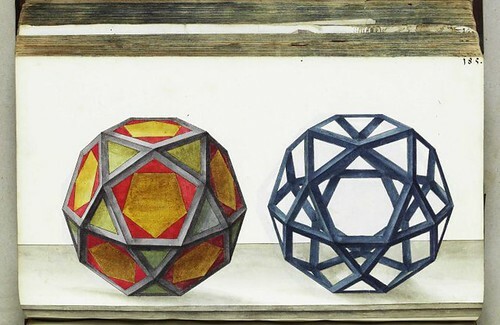 In the case of a dodecahedron, for instance [5th image from the bottom below], he outlined the boundaries of its twelve surfaces with bands of colour. 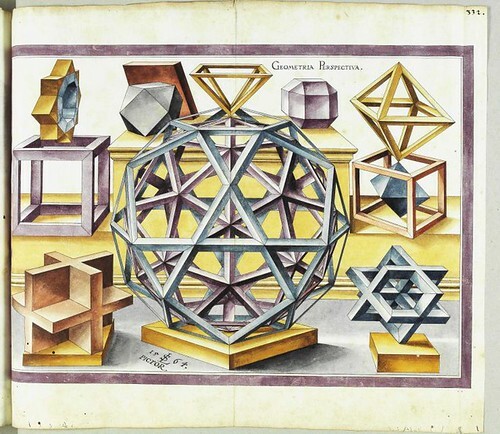 In each of these he then inscribed a pentagon." Veltman goes on to intimate how the colour manuscript - although never published - offered a logical means by which designs could be readily adapted for marquetry, with different wood types matched to the colours; so perhaps Stöer's influence was in fact more significant than suggested above. 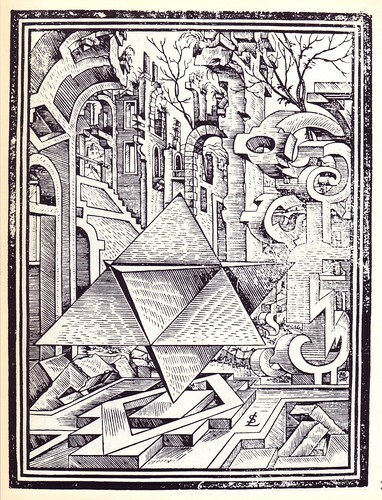 Thanks very much to Will from A Journey Round My Skull for providing the high resolution scans of 'Geometria et Perspectiva' seen above (again!). 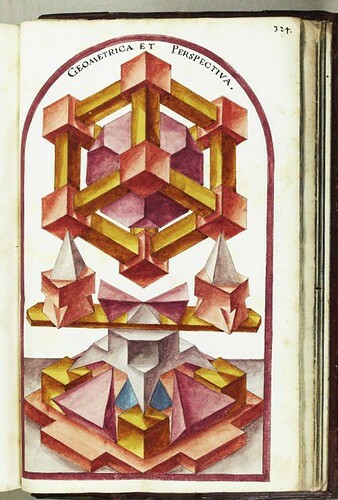 The coloured images below come from the large Munich University Library manuscript called: 'Geometria et Perspectiva: Corpora Regulata et Irregulata'. 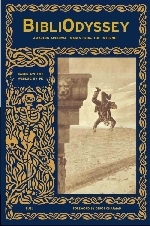 Harald Fischer Verlag sell a cdrom (€88) which includes all the Stöer illustrations together with commentary. Their website is the source for all of these following images (I have posted the majority, but not all of them). Update (Aug 2013) Harvard's catalogue page for the book below (they have a few images online too). Great find. 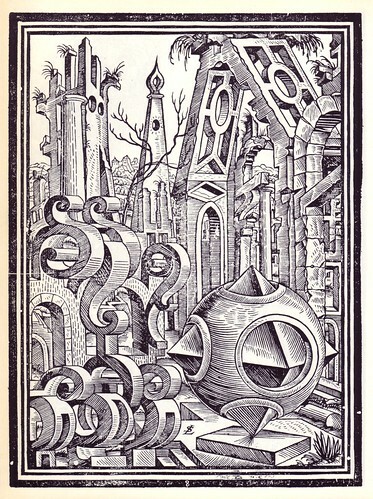 Another reference of interest is Wood, Christopher S. (2003). 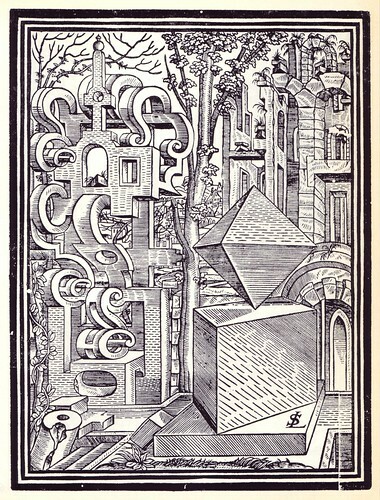 The perspective treatise in ruins: Lorenz Stoer, Geometria et perspectiva, 1567. 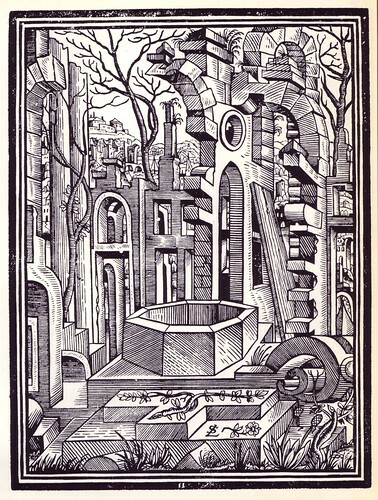 The Treatise on Perspective (Studies in the History of Art, n.59). Washington: National Gallery of Art. Amazing. 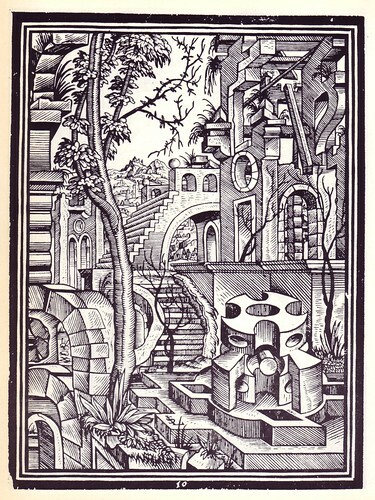 I wish I could draw these kind of images. Thanks for the post. Thank you for this wonderful post! I was struck with how modern these drawings appear to me. I kept looking for a "D" lurking somewhere in the vicinity of the monograph "LS". 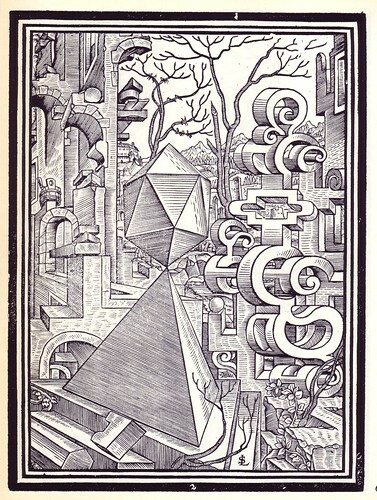 I'm very interested in the history of linear perspective in which Nürnberg artists and mathematicians played an important role. As you might know I live and research near Nürnberg. Somehow Stöer had got in under my radar until now which is even more strange because I write the English advertising texts for the Harald Fischer Verlag who are friends of mine! Thanks for the illustrations they're great.